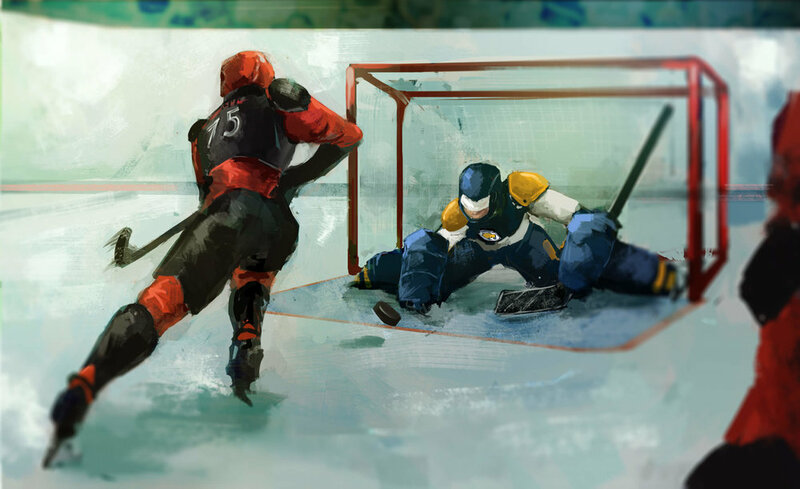 2 minutes into the game, the Wildcards had a scare as Kara Okeke plowed into the Wildcard net after a rush, taking down Jules Arquette, the goaltender. Okeke was sent to the box, but for a few moments, Arquette seemed down for the count. An ISMO medic came on the ice to examine Arquette and, fortunately, giving her the thumbs up to stay in the game. Without a strong back-up player capable of playing goal, the Wildcards averted what could have signaled a quick end to their championship intentions. Arquette was tested immediately after with a blistering shot from Fredrick Mattila, followed by a dangerous rebound shot by Captain Janice Campbell on the opposite angle. Arquette prevailed. This game was, indeed, a battle of the goaltenders. Despite the aggressive play and numerous scoring chances, both Bailey and Arquette locked the doors, fending off 15 shots-on-goals apiece over the 3 periods. The game was to be decided in overtime. While both teams were evenly matched during regulation play, the Wildcards must have had an epic pep talk over the 5 minute intermission because they absolutely exploded onto the ice. They controlled possession of the puck forcing the Moles on defence, holding them to only one shot on goal before Okeke was sent to the penalty box for tripping 12 minutes into overtime. With the advantage, the Wildcards seized their moment. After winning the faceoff in the Moles’ zone, the Wildcards sent a volley of shots at Bailey, whose luck eventually ran out. Brandon Phan looped along the left ramp, faked a shot that sent Bailey the wrong way, and connected a cross ice pass to Peter Lehmann who easily tipped it into the wide open net. The Wildcard win extends the series to a third game to decide the championship. As an ‘unofficial’ final to the ISMO exhibition tournament, there won’t be a trophy or cup at stake, though you would hardly notice with the passion and intensity radiating from the teams and fans. The deciding game will be played next Saturni on Rishabha the 21st.